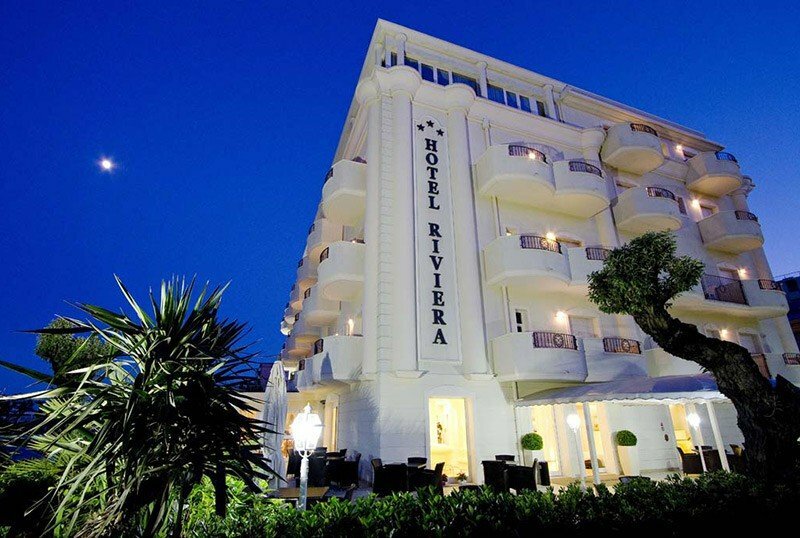 Hotel Riviera , elegant 3 star superior in Milano Marittima, recently renovated, is located in front of the private beach, to which it has direct access. It has free parking, services for children, garden and solarium. The hotel is located in Milano Marittima just by the sea, with direct access to the private beach. The city center is about a ten minute walk away, as is the port that divides Cervia from Milano Marittima. The rooms are equipped with air conditioning, balcony, safe, telephone, satellite TV 26 ", minibar, WI-FI, private bathroom with shower and hairdryer. SUITES: they are located on the top floor, with sea view. DELUXE: completely renovated with elegant furnishings, fine and overlooking the sea. FAMILY: connecting rooms (not sea view) with a shared bathroom. SUPERIOR: rooms completely renovated and with a new bathroom, facing the front of the structure, with a side view of the sea. ELITE: renovated rooms overlooking the inner courtyard. Private beach with direct access, garden, terrace, solarium equipped with sunbeds and beach umbrella, lift, reading room, free use of bicycles, paid laundry, possibility of beauty treatments and massages, theme nights, beach towel and newspapers available. PARKING: free and uncovered while seats last. CONVENTIONS: beach, amusement parks, discos, gym, swimming pool, spa. BREAKFAST: international buffet, set up in the garden. LUNCH AND DINNER: 4 choice of meat and fish menus and buffet of appetizers and vegetables. The meals conclude with desserts and desserts. VARIATIONS: vegetarian cuisine and menus for coeliacs. In hotel: equipped outdoor playground area, strollers, bicycles with child seat (on request), baby / mini / junior club. On request and payment: pediatrician and baby sitter. In the room: cots, safety sides. At meals: baby food , baby menu, high chairs, bottle warmers, colored placemats, dedicated cutlery, flexible hours. At the beach: mini club, playground area. The hotel has a private beach with direct access and agreements with the Giuliano, Peppino and Paparazzi baths. Easter, hotel on the sea! Do you already want a preview of summer? Then let yourself be tempted by our staff who will fill you with cuddles for a few days !!! News 2019: the kids club service will also be held in the evening! Treat yourself to a stay directly on the beach of our Hotel Riviera. Can't wait for June to arrive for the summer holidays? Start thinking about your holidays, choose the June sea offers all inclusive in Milano Marittima, and give yourself a stay directly on the beach, guest of our Hotel Riviera. Accommodation in Elite Double Room renovated with an elegant and modern style. Start thinking about your holidays, give yourself a stay directly on the beach, you will be a guest of our Hotel Riviera!